There was a whole-lotta-bakin-goin-on yesterday! I baked my favorite Sweet Potato Cake with Golden Berries. 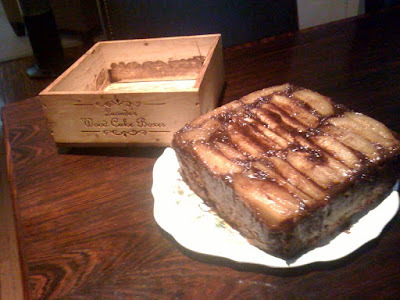 My friend and fellow cook, Anne made Ginger Pear Upside-Down Cake. Anne got the recipe from Saveur who got the recipe from Seattlest who adapted the recipe from Leslie Mackie’s Macrina Bakery & Café Cookbook. In the spirit of full disclosure, I haven't a clue where Leslie Mackie got the idea! 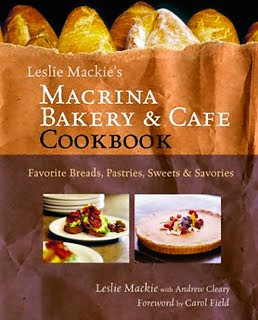 Anyway, if you don't want to click through all the links, here's the recipe from Anne--Saveur--Seattlest--Macrina Bakery--Leslie Mackie. To make the topping, combine 3 Tbs butter, ½ cup brown sugar, and cinnamon in a medium saucepan. Melt the butter over medium heat for about 1 minute; then pour the mixture into the prepared springform pan, completely coating the parchment paper. Place the quartered pears on top of the butter-sugar mixture, lining the pieces up tightly in a decorative circle so that none of the bottom shows through. To make the batter, cut 2 sticks of butter into 1-inch pieces, and put them in a large mixing bowl. Add ¾ cup brown sugar, and cream the mixture on medium speed for 3-5 minutes, until it is smooth and a pale tan color. Add the grated ginger, and beat 1 minute more. Scrape down the sides of the bowl with a rubber spatula. Add the eggs one at a time, beating on low speed and making sure that each egg is fully incorporated before adding another. When all the eggs have been added, slowly pour in the molasses and beat to fully mix. The mixture will look as though it is “breaking” or curdling, but don’t worry—it will come together when the dry ingredients are added. In a separate medium bowl, sift together the flour, baking powder, baking soda, and salt. Whisk to fully combine. Alternately add small amounts of flour and buttermilk to the batter, stirring and folding with a rubber spatula until the dry ingredients are just absorbed. Do not overmix the batter. Pour and scrape the batter into the pear-lined pan, smoothing the top with a rubber surface. The pan will be nearly full. Anne, of course, adapted the recipe to use in Lucinda's Wood Cake Boxes, which is easy to do, she just lowered the heat a pinch. My only regret is not being there to taste it!